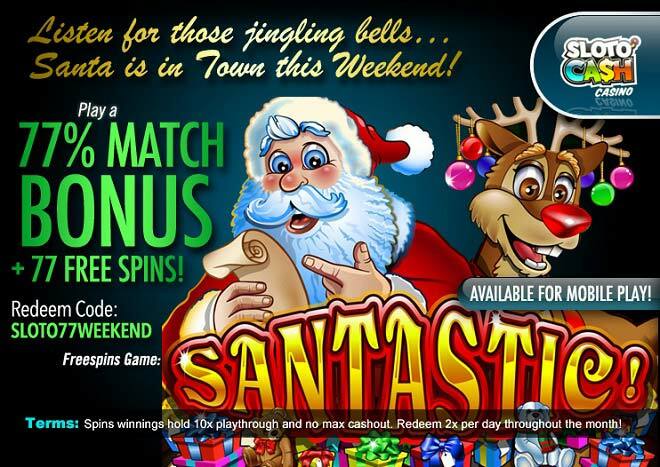 Jingle Bell Towards a Winning Weekend With Sloto'Cash 77% Bonus + 77 Free Spins! This December you’re going to want to jingle all the way towards winning weekends when you play with Mr. Sloto’s 77% Match + 77 Free Santastic Spins! Jingle around the clock when you spin Santastic and enter a jolly world where any 3-of-a-kind winning combination will take you to the Festive Feature game where a special Bonus Meter will award you with a 2,500x your bet per line prize! Win one or three Jackpot Spins, or up to 25 free spins games! Fill your pockets with more than jingles this Christmas when you spend your weekends playing with a 77% Match plus 77 Free Spins! Play a 77% Match Bonus + 77 Free Spins!